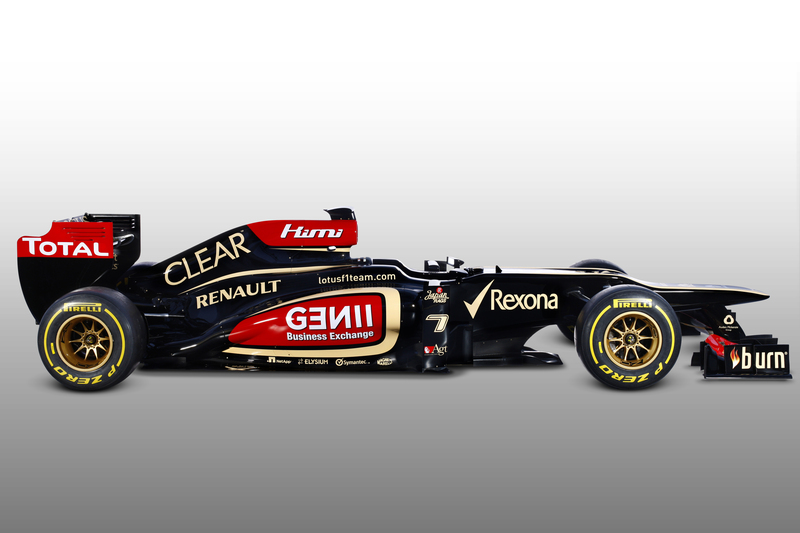 Lotus F1 team is the first F1 team to launch its 2013 F1 car with the E21 being unveiled on Youtube this evening. The car is, inevitably, a development of last year’s E20, given that this is the last year of the current Formula 1 and regulations are very tight. The team hopes that development over the winter will result in better performance so that Kimi Raikkonen and Romain Grosjean will be able to score better results than last year, when the team finished fourth in the World Championship. What is noticeable is that the team does not have the much-rumoured sponsorship from Honeywell, however the appearance of much more red on the car (Honeywell’s corporate colour) suggests that the deal is still on the cards. Kimi Raikkonen says that the aim this year is to do better than in 2012. The team has three other drivers on its books with the announcement of Davide Valsecchi as Third Driver, Jérôme D’Ambrosio as Reserve Driver and Nicolas Prost as Development Driver. The E21 has been designed by James Allison and his team at Enstone. “Depending on where you look, some parts of the new car are a ground-up redesign and in other areas we have further optimised the best bits of the design philosophy we’ve adopted for several seasons,” said Allison. “The front and rear suspension layouts are substantially revised to try and give us better aerodynamic opportunities. The front wing is a continuation of the concepts we have worked on since the 2009 rules were published. For the rear wing system, we’ve continued to try to work on having a satisfactory level of rear downforce stability whilst having maximum DRS switching potential. The team has benefited from a great deal of investment at Enstone in the last couple of years. The ‘driver-in-the-loop’ simulator went live at Enstone in 2012 and enables a driver to give input into the development process. The team also has a new gearbox dyno facility. Team chairman Gerard Lopez said that much of the work in relation to the team has been behind the scenes. No Honeywell yet but they have manged to poach CNBC from Marussia. Not sure I like the red, hopefully It will look better on track. 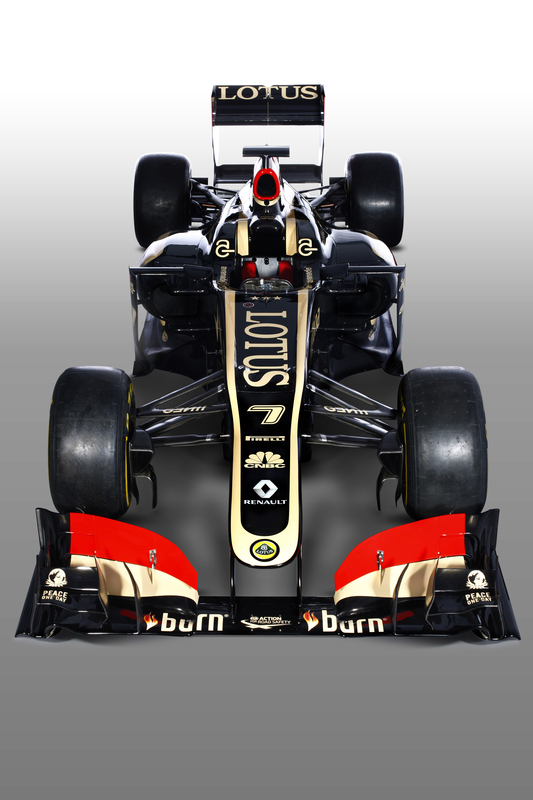 on January 28, 2013 at 7:45 pm | Reply Greg D.
What’s the point of the “cosmetic piece” nose regulations if teams can ignore them ? The nose is still ugly. I was hoping F1 would walk away from the duck-billed platypus this year. I believe they are holding back on the ‘modesty panel’ until they can show an aerodynamic advantage. Like a lot of launch cars it has a lot of old pieces on. A few sites quote James Allison saying they’re basically working on modesty panels that increase downforce too – they just need to figure out if it offsets the slight weight penalty. Same here – I’m sure a read something from Charlie Whiting about cars better this year in this area. Maybe designers now prefer it for other reasons best known to them. Hope McLaren haven’t changed their design philosophy – by far the best looking car last year. Enstone…Enstone…Enstone. Did the L Word crop up at all? Looks beautiful. Here’s hoping this team can pull off more than the canvas cover. What is the difference between a third driver and a reserve driver? The difference is that one is called a reserve driver, the other a 3rd driver. Neither name matters. It’s down to how the team use & name them. Teams have decided not to use their “official” reserve driver previously (Sauber in 2011 when they needed someone to step in for Perez). Same for Friday driving – the driver used only needs to be nominated with the FIA at the appropriate time, with or without a title within the team. What has happened to this smoothing of the nose that was touted earlier in the year? I thought the stepped noses were on their way out, to be replaced by some cosmetics on top? The cosmetic panel is optional. 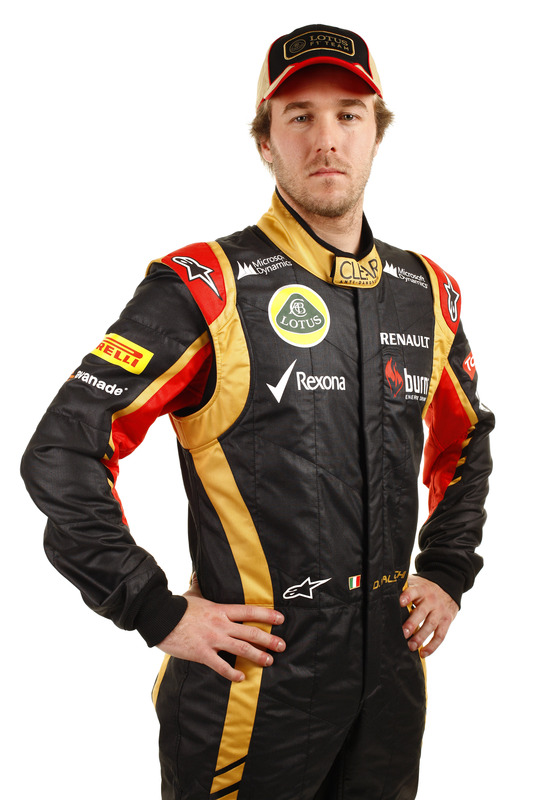 Do you think that Valsecchi will be getting Friday drives from time to time? No sign of any Burn, either…while red is Coke-territory…! It’s on the front wing, but it hardly looks like a massive deal given how much publicity there was over it. It’s their £2.5m package. I have the proposal on my desktop. Maybe that was last year’s £2.5 million package. Does it include the front visibility? Yes it does. And visibility on their Race suits, garage branding systems, press releases, website etc. It still has that horrible stepped nose. I thougjt they had been banned. Or discouraged. With in season testing banned these day’s why do teams need so many drivers? I know they do a lot of simulation work at the factory but having five drivers is a bit excessive. Valsecchi is the third driver, D’Ambrosio reserve driver, Prost development driver, they are unlikely to ever drive the car except for maybe some straight line testing. Because some bring money and there is a LOT of work done in simulators. I don’t mind the nose and if the modesty panel is not compulsory why have it? It adds a little bit of weight but could possibly be used for aerodynamic advantage so pros and cons I guess. If its fast, its beautiful. PS Joe will you be talking in Melbourne this year? I think the stepped noses look hideous (though they don’t hurt my retinae like they did 12 months ago), but the numbers from the wind tunnel/CFD/track testing trump all aesthetic considerations. Ditto rmm but the front wing, looking again, also looks ungainly doesn’t it? It’s a real pity that these things aren’t properly considered by the FIA in terms of aesthetics and performance combined ie minimum uglyness possible! Handsome is as handsome does, they say. I hated the look of rasied noses when the first arrived (Tyrrell 019) but, because they work, I like them. Fair comment rmm. I was looking at the Lotus 49 the other day, in launch form – pre-Gold Leaf sponsorship, no aerofoils, no engine fairing/cover. What a beautiful car – I worshipped that car when I was a young lad! I never understood the ‘voluntary’ modesty panel advertised by the FIA. I mean, if there was any gain to be had by it teams (McLaren and Marussia, notwithstanding) would have done it last year, and there would be no such thing as stepped noses. Unless the panels gives any gain, teams won’t use it. Why would they? The “modesty panel” wasn’t legal last year. The front bulkhead was one height, the tope the nose was lower. The transition (along the longitudinal axis of the car) was over a distance of (I think) 150mm. McLarena and Marussia avoided the step by having the bottom of the nose under the front bulkhead much closer to the reference plane. This may (or may not, I haven’t the data) have carried with it an aerodynamic penalty. This year the blending from one height to another can be done over a much greater length, but must be non-structural. I was expecting more mention of “burn” than on just the front wing. That was a major announcement for the ‘Enstone Team’ and yet the word ‘Lotus’ still appears larger in two more prominent places despite – and correct me if I’m wrong here, Joe – Lotus handing no money to the team. “Himi” appears more prominently than “burn”, and I’ve never even heard of them (although I realise that’s the whole point of advertising). I believe it says Kimi. The red spaces I think are meant for Honeywell. That deserves a childish LOL. Himi?! Don’t be too embarrassed, good graphic design should be readable – especially at 200mph! Shame about all the red – didn’t take long to start diluting the ‘brand’. What brand? John Player Special? Well clearly they’d adopted it as Lotus brand colours / design – hence why it appears on “Lotus” cars in other racing series despite the JPS Lotus never appearing in, for example, the American Le Mans Series. – who or what is avanade? Sounds like an energy drink 😉 – were they there last year? – no Henri-Lloyd anywhere I can see, no Alpinestars on the car (& not much on the overalls), which makes me think they’ve been putting out press releases about not much recently. – On the other hand, the CNBC sticker looks new & I don’t remember an announcement about that. – the ‘Kimi’ script (both the idea and the execution in that horrible font) is like something HRT would have done. 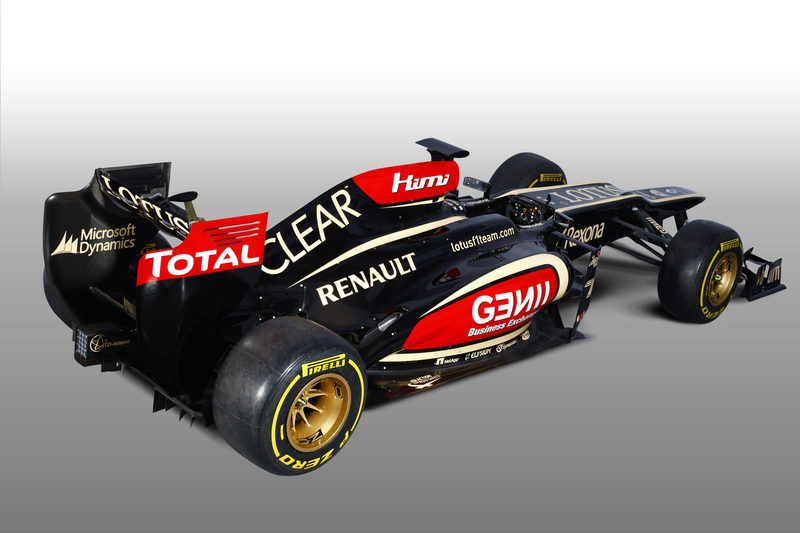 Smacks of desperation, and the typeface doesn’t convey F1 brand values (John (Other John) – comments? Happy to concede if you think differently). – the car is quite possibly a gussied up E20. Isn’t that what Lotus did last year? Reveal a 2011 car with the FEE removed? Avanade is an IT consulting company specializing in Microsoft solutions. they are a subsidiary of Accenture. Accenture is the world’s largest consulting company (by revenue). Magneti Marelli = Engine ECU and electronics. All the sponsors I know above have been around for years. Who are the rest ? It’s an overseas name for Sure anti perspirant then, I would never have known had I not seen that youtube clip. I understand that google and wikipedia are your friends, but the point I was trying to make was these companies have virtually no other exposure, certainly in the uk that i’m aware of, such that I have no knowledge of who they are, or what they sell/make. 1) Businesses who deal with other businesses and not consumers – Magneti Marelli are a perfect example and while many F1/motorsport fans know what they do, 99% of fans aren’t their target audience. These guys tend to be suppliers to the team in question, but still insist on a little logo being shown so that everyone *knows* that they’re suppliers to the team in question. Some of them also get the team in question to participate in parts of their advertising, which is why you’ll find James Allison on the back cover of the current edition of Private Eye. 2) Brands which don’t exist in the UK but are very strong elsewhere. Rexona is a classic example – as yet Unilever hasn’t switched names from “Sure” in the UK and EIRE but to the rest of Europe Rexona is a very familiar brand. Wiki tells me that North America sees Rexona sold as “Degree”, but it seems that everyone else in the world gets Rexona. It’s a similar story with Axe, which you may know as “Lynx”. Clear is yet another Unilever brand, similarly unavailable in the UK. The obvious questions are “why not unify the brands?” and if/when Unilever will do so. The answer is probably that they’ve almost certainly considered it and very informed people have decided not to, so they must think it’s a dubious move to make. Possibly in some regions they would open themselves to copyright disputes or simply confusing customers. Bear in mind that Unilever also own Cif, which used to be Jif in the UK (and remains so in some areas according to Wiki), and the sales data might simply say that changing a name of a strong brand was/is a bad move. The point you’re making is exactly why those brand names are there.. It is proven that people respond more positively to names they have seen or heard before than they do to ones they haven’t. It has also been shown to be advantageous to your survival for your brain to conjure the illusion that you’re in full control of the decisions you make when the reality is that you’re not really. Hence your natural reaction to argue that the advertising activity being discussed here is pointless and won’t persuade you – which I think is the underlying argument you’re trying make. Also, the focus for much of the marketing activity in F1 is not currently aimed at the UK. F1 is a global advertising medium that gets names in front of people that otherwise wouldn’t necessarily have heard or seen them before. You haven’t heard of them before and neither has a large proportion of the world’s population. Now you all have = mission accomplished.. on a global scale. Detailed information about the company and what they do is not required to exploit the mechanism described above. It helps if the name is positively associated with something such as a race winning team, but it’s not essential. The seed of familiarity will still be sown. Avanade is (or at least was) a technology consulting company – I thought it was a joint venture between accenture and Microsoft, but I could be wrong about that. Joe – Caterham must be having a private smile about “Lotus 7” being prominent on this particluar car 😉 Free advertising for their road car…?